President James Michel has been conferred the ‘African Development Excellence Award’ during the African Investment and Development Awards Ceremony held in New York to coincide with the holding of the United Nations General Assembly. The award, presented on 25th September, was accepted by Vice President Danny Faure on behalf of President Michel and the people of Seychelles. 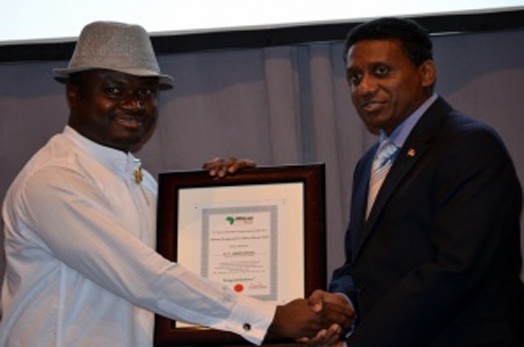 The Award was presented by Dr. Ken Giami, the CEO of African Leadership Magazine and founder of the Centre for Economic and Leadership Development, an NGO with consultative status with the United Nations Economic and Social Council (ECOSOC). Dr Giami stated that President Michel emerged winner of the award after a careful selection process by their board of advisors in recognition of his leadership in Seychelles and on the African continent. “Under your leadership,” Dr Giami said, “the Republic of Seychelles has risen to become a beacon of hope for political stability, economic growth and prosperity especially in an environment where such attributes are in short supply”. Dr Giami added that Seychelles is “one of the shining lights in Africa, setting for itself the enviable record of being not only a bastion of political freedom but also an emerging regional economic hub”. In his address, the CEO of the world-renowned magazine stated they are proud of the work that President Michel is doing in the Republic of Seychelles. “You have elevated the status of your country as one of the best governed countries in Africa; and we do look forward to continuing to showcase the impact that your leadership has brought to the people of Seychelles,” Dr Giami said. In his message conveyed by Vice President Faure on the occasion of the ceremony, the President said: "I am deeply honored to receive the African Development Excellence Award. I accept it on behalf of the people of Seychelles and I dedicate it to them. I consider the conferment of this prestigious award as recognition of our achievements as one of the best governed countries in Africa, stemming from the hard work and commitment we have put in a human-centered approach to development". President Michel is the recipient of several international awards, including the Outstanding Civilian Service Medal conferred on him by the Secretary of the United States Army in 1995, the UNESCO Gold Medal of the Five Continents in 2009, the Most Innovative People Award (for Natural Innovation) by the Global Leadership Team at the Lebanon 2020 Summit in 2009, the Special Award for Eco-Safety from the World Eco-Safety Assembly of the International Eco-Safety Cooperative Organization in 2010, the Grand Cross of the Knightly Order, Special Class, Pro Merito Melitensi of the Sovereign Military Order of Malta in 2010, Grand Commander of the Star and Key of the Indian Ocean (GCSK) in 2012 awarded by the Mauritian Prime Minister, and the Sustainable Development Leadership Award 2013 conferred at the Delhi Sustainable Development Summit by The Energy and Resources Institute (TERI), from which he holds and honorary doctorate.